sioner as Rep. Christie Carpino and Sen.
PORTLAND, CT – State Senator Art Linares (R-33) and Representative Christie Carpino (R-32) were joined by Department of Veteran Affairs Commissioner, Sean Connolly, First Selectwoman Susan Bransfield, and Town Clerk Ryan J. Curley at the Portland Veterans Wartime Service Ceremony on June 29 at Portland High School. They distributed Connecticut War Time Service Medals to about 60 recipients or their families. Rep. Carpino welcomed the audience to the ceremony after the presentation of the colors by the Portland Fire Department and National Anthem played by the National Honor Guard. First Selectwoman Bransfield and Town Clerk Curley read aloud the names of each recipient, including those being honored posthumously. Rep. Carpino and Sen. Linares took turns giving recipients a bar pin that accompanies the medal pinned on the veterans by Commissioner Connolly. 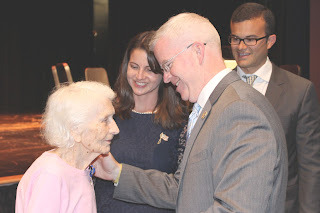 “It is truly an honor to pin the Connecticut Wartime Service Medal on Connecticut’s great veterans and be a part of such an incredible showing of appreciation for their service, sacrifice and dedication to our state and country,” said Commissioner of the Connecticut Department of Veterans Affairs, Sean M. Connolly. The Connecticut War Time Service Medal is available to Connecticut Veterans who have performed at least 90 days of wartime service as a Connecticut resident. For more information about the Connecticut War Time Service Medal program visit www.ct.gov/ctva or call 860-616-3600.